Inspection squads from the ministries of labor and interior started on Monday massive raids across Saudi Arabia to catch labor and residency law violators following the end of the amnesty period. 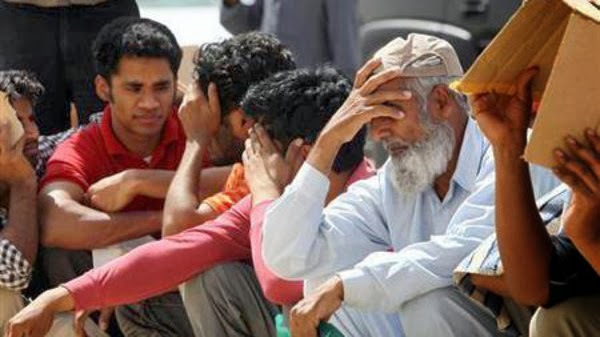 According to sources, thousands of illegals were apprehended in various regions of the kingdom. A total of 1,899 unregulated expatriate men and women were arrested in Jeddah, according to Nawaf al-Bouq, spokesman of the Jeddah police. Some 2,200 were arrested in the area of Samta, 379 in the Eastern Province, 208 in Baha, 150 in Tabuk, 85 in Yanbu, and 80 in Hafar Al-Batin, according to initial figures released by the authorities. Bouq said that inspectors raided several public places and squares as well as places where illegals used to gather in various parts of the city. “Since early morning, security campaign got to a vigorous start as inspectors swung into action under the supervision of Jeddah police chief Maj. Gen. Abdullah Al-Qahtani,” he stated. “The campaign covered all areas where illegals used to assemble, and that is in line with the plans and programs prepared jointly by the concerned agencies,” he said, adding that the inspection of firms and shops that may be employing illegal workers is in the jurisdiction of the Labor Ministry. Reacting to reports about the gathering of Indonesian illegals, Bouq said that these community members were outraged over the slow pace of the final exit procedures by their consulate. “They want to leave the kingdom for good but their paperwork was still unfinished at the consulate. We will try in coordination with the consulate to expedite the procedures to ensure their return,” he said. Bouq said these workers have been transferred to the detention center and they will remain there until the completion of the final exit procedures. Meanwhile, the streets of many cities were quiet. Building sites were deserted, Riyadh’s stuttering rush-hour traffic flowed smoothly and many shops and market stalls were closed in normally busy neighborhoods that are home to large numbers of the expat community. In the Riyadh Industrial Zone, where many workers are foreigners, most shops were closed on Monday morning, according to a witness who said he saw a dozen people scurry for cover when they heard a police siren from a nearby road. “Nobody has come to buy anything at all today. It’s a very bad situation,” said Abu Safwat, a Syrian who owns a machine parts shop in the area. A long queue stretched down the road outside a visa office as foreign workers tried to leave without paying fines for overstaying. Some carried personal possessions in hopes of leaving immediately. A Sri Lankan woman working as a freelance maid in Riyadh said she and several of her friends had decided to stay at home in case they were caught up in government raids. In the Batha district, home to many low-paid foreigners, some shops were shut and only Saudi employees were working in others. Market stalls had vanished from the normally busy street where vendors hawk fruit, vegetables, clothes and mobile phones. “The field security campaign, in coordination with the Labor Ministry, will take place in all cities, provinces, villages and rural towns,” Interior Ministry spokesman Major-General Mansour Turki said in a statement on Sunday. Before the amnesty period expired on Monday the government issued repeated warnings to foreigners to correct their status or face punishments including prison, fines and deportation. Companies employing expatriates without proper visas will also be fined, as will people or firms that charge expatriates a fee to sponsor their visa.